Shrubby groundcover coral creeper has a pretty cottage-garden look, flowering on and off all year with bright reddish-coral blooms. Appealingly haphazard in appearance, it works best in an informal landscape or cascading over the sides of a container. 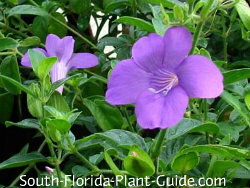 This plant grows fast to 1 or 2 feet tall and covers an area in no time flat. It needs regular edging to keep it controlled. It can appear "weedy" - and can actually become a weed in your yard if you don't keep it in bounds. 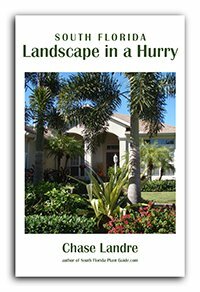 These groundcovers can be used as foundation plants under low windows, surrounding a palm or mailbox, filling in under trees (with at least dappled sunlight), or decorating the patio or porch in a hanging basket. They can also be used along a deck or porch and allowed to climb posts and railings. Despite the word "coral" in the name, this plant is also available with pink ('Pink Star') or purple ('Purple Prince') blossoms. Each flower is followed by light brown seed capsules, the look of which isn't pretty to everyone. This is a fast growing ground cover that does well in sun to partial shade. It prefers the warmth of Zone 10 but may survive in Zone 9B if winter is mild. The height varies from 1 to 2 feet. Flowers appear on and off all year. Trim edges as needed to keep the plant contained where you want it. Give it an overall "haircut" in spring (late March or early April) - or more often if it needs it. Water on a regular basis but don't keep the area overly wet. Fertilize in spring with a quality controlled release fertilizer. 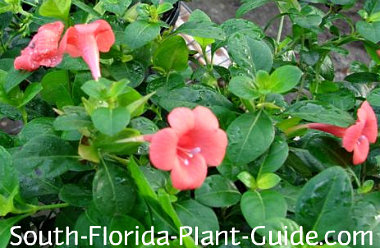 Place these plants about 2 to 3 feet apart. Come away from nearby plants at least 2 feet. Once it gets going, coral creeper can clamber over small shrubs...and even climb up trees. Come in from walks and drives at least 2 feet. 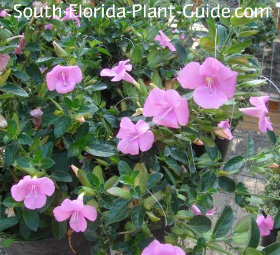 These plants make wonderful container plants, spilling nicely over the sides of a tall pot or hanging basket. 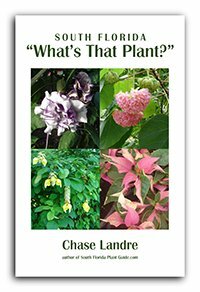 COMPANION PLANT SUGGESTIONS: Croton, copper plant, crinum lily, gold mound, and hibiscus.